EarthQuaker Devices is known to produce some of the best boutique effects pedals available today. They don’t usually go overboard when ti comes to the complexity of their designs, but this brand is definitely capable of keeping up with the pack. Their EarthQuaker Devices Tentacle Analog Octave is rather surprising. 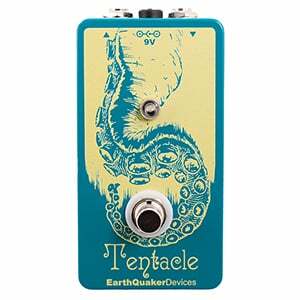 Compared to other great octave pedals on the market, Tentacle Analog octave pedal is as basic as they come. With that said, EarthQuaker Devices knew exactly what they were doing, which is partially why so many fuzz users love this pedal. What EarthQuaker Devices did was essentially making a stand-alone version of the Octave effect you can find in their Hoof Reaper fuzz pedal. Now, one of the original uses for the octave of any kind was to give the fuzz pedal of your choice some range. That is exactly what Tentacle was designed to do. In a way, it’s very limited compared to other pedals in this category of effects, but there are people who need something that only a basic design such as this one can deliver. The enclosure everything is packed is pretty sweet looking and very lively. Then again, it’s EarthQuaker devices we are talking about here. This part of our review could have been left blank and nothing of value would be lost. We say this because this pedal essentially has no controls at all. All you get is a standard footswitch and a LED light that indicates when the effect is on. Giving the user no way to adjust the effect was one of the main points of EarthQuaker Design’s idea for this pedal. They wanted to create something that you would just hook up to your signal chain and forget about it until you decide to use it. How this translates to practical use depends on the person using it. 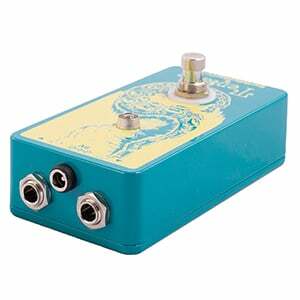 When you press that footswitch and open up the Tentacle Analog octave pedal to your signal chain, the tone you get is pure sonic pleasure. Since it is analog, your selection of pickups will have an impact on the way this thing sounds, as will the notes you choose to play. For example, you will get a much more present octave effect once you cross the 12th fret. Paired with a good quality fuzz, this pedal gets you exactly the type of performance you would want to hear from this combo. While it sometimes feels like Tentacle analog octave pedal is just not good enough compared to modern octave designs, it delivers a niche type of performance you will be hard pressed to find elsewhere. On top of that, there’s a number of guitar players out there who love the simplicity of this design and swear by it. With all that said, you definitely need to make sure your application is going to be compatible with the Tentacle. In other words, if everything falls together right, this pedal can be your best friend for life. Otherwise, it can be your worst nightmare. 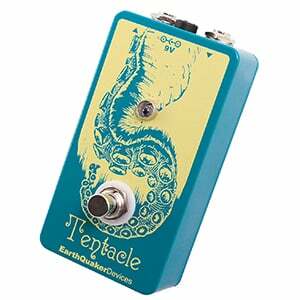 For more info about the EarthQuaker Devices Tentacle, click here. For more Octave Pedal Currently On The Market, click here.